This is not an easy waterfall to find on your own. You are advised to find a guide if you're looking for it. But if you are up for the challenge, while you are on the crater rim road known as the Jl. Raya Wanagiri running along the Danau Buyan, look for a road with a faded sign leading away from the lake, and then follow the arrows. Once you have reached, the trouble is all worth it. Twin waterfalls fall down endlessly, cascading over rocks in shimmering curtains. The pool of water that they form looks inviting and undisturbed, and it is only two meters deep. Foliage shrouded cliffs rise around you. You won't find a better hidden gem. By Car: From Jl. Raya Wanagiri, go down the road with the faded sign leading away from the lake. Follow the painted orange arrows until you have to park. Then it’s a rough but short 200-300 meter hike to the waterfall. How popular is Banyumala Waterfall? People normally club together Danau Tamblingan and Gitgit Waterfall while planning their visit to Banyumala Waterfall. What a beautiful beautiful waterfall. The trek down to the waterfall is so exotic and exciting. It's not so easy but it's also not hard. When we reached there was barely anywhere there so it really felt like we had the waterfall for ourselves. The water is so clean and cold. We recommend to go with swimwear and good shoes. 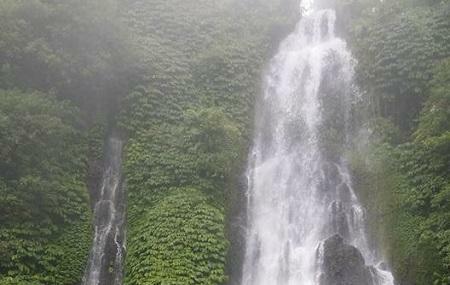 One of the nicest waterfalls in Bali! So beautiful waterfall..no wonder people will do whatever it takes to came here although you need to hike a route to go in there..it took you almost 15 to 20 minute walk before you can see a wonderfull waterfall with your own eyes. Amazing..the water is so clean and make your trip so meaningful.. I went early and arrived 10 min before 7am. There was absolutely no one there. Breathtaking. If you coming with a scooter. Be careful the last 10 meter is dangerous and I fell. So park and walk instead. Where hike shoes as its slippery. Loved it. Sunny day so I got lucky. Serene and quiet just me and nature. Be ready for stairs. Great place for nice pictures, enjoy and swimming. Waterfall is not so big, but beautiful and comfortable for swimming. Entrance is 30 000 rupiah - about 20$. The steps to go down to waterfall and stones near by are very slippery, so be careful. Magic. Pure. Magic. Bit of a hike to get there, easier getting back (calf muscles will hurt the next day) but such an amazing experience. Lush jungle surrounds this beautiful waterfall, go for a swim and get 'purified' in the blessed waters.